The main difference between dorsal and ventral is that dorsal refers to the back or upper side of an organism whereas ventral refers to the front or lower side. These are two anatomical terms used to describe the location of structures of the body in anatomy and embryology. In humans, the dorsal side refers to the posterior side while the ventral side refers to the anterior side of the body. ‘Dorsal’ is the anatomical term that describes the structures located towards the back of the body. Also, it refers to the anatomical structures located at the upper side of the body. Moreover, this term comes from the Latin word for ‘back’, which is “dorsum”. Furthermore, the upper fin or the dorsal fin of dolphins or sharks is a common example to describe this term. Additionally, when describing the structures of humans, the term ‘dorsal’ gives a similar meaning to the term ‘posterior’. ‘Ventral’ is the opposite anatomical term to the ‘dorsal’ and it describes anatomical structures located towards the stomach of the body. Therefore, it refers to the structures located at the lower side of the body. Similarly, this term comes from the Latin word for ‘belly’, which is “venter”. Moreover, in humans, the term ‘ventral gives a similar meaning to the term ‘anterior. For example, the human eye is located ventral to the brain. In other words, it is located at the anterior side of the head. They are two anatomical terms used in anatomy and embryology. Dorsal refers to ‘towards the back’ while ventral refers to ‘towards the stomach’. 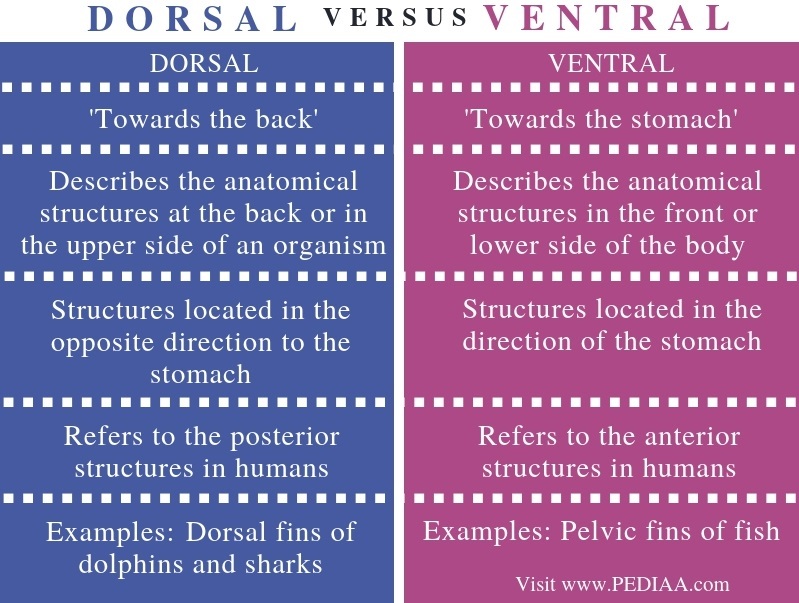 Thus, this is the difference between dorsal and ventral. The main difference between dorsal and ventral in anatomy is that the term ‘dorsal’ is used to describe the anatomical structures at the back or in the upper side of an organism while the term ‘ventral’ is used to describe the anatomical structures in the front or lower side of the body. While dorsal structures are located in the opposite direction to the stomach, ventral structures are located in the direction of the stomach. In humans, the term ‘dorsal’ gives a similar meaning to the term ‘posterior’ while the term ‘ventral’ gives a similar meaning to the term ‘anterior’. 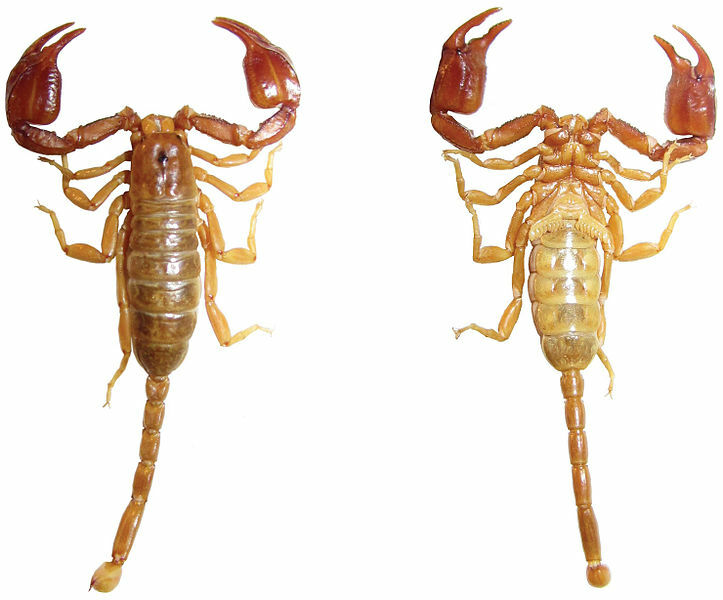 Hence, this is another difference between dorsal and ventral. Moreover, dolphins and sharks have dorsal fins while the pelvic fins of fish are ventral. The term ‘dorsal’ refers to anatomical structures at the back or in the upper side of the body of an organism. On the other hand, the term ‘ventral’ has the opposite meaning to the term ‘dorsal’, referring to the anatomical structures in the front or lower side of the body. In other words, dorsal structures are located in the opposite direction to the stomach while ventral structures are located at the side of the stomach. 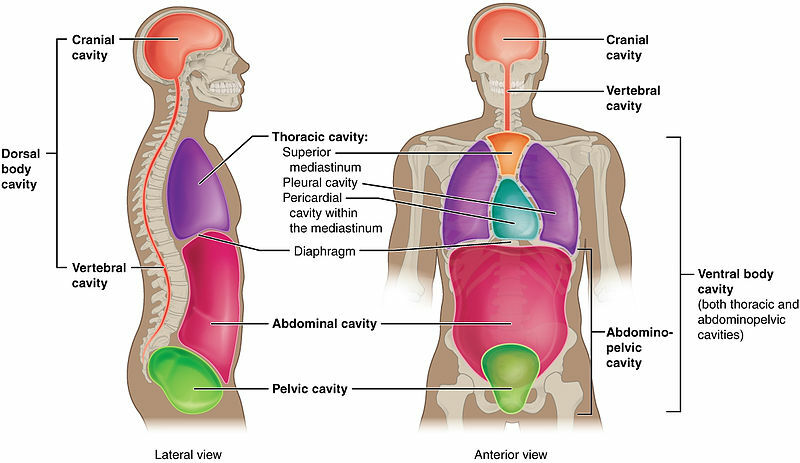 Therefore, the main difference between dorsal and ventral is the relative position to the stomach. 1. “Dorsal vs Ventral.” Kenhub, Available Here.